Would you like to discover the remarkable undersea world off the shores of Nassau and Paradise Island, but don't have the spare time or money to become certified before arriving in the Bahamas? Bahama Diver's Dive In A Day Resort Course is a great method for uncertified divers to experience diving off the Bahamas without spending their vacation on a lengthy certification course. After a brief classroom orientation, acclimation in a swimming pool, participants in this discover scuba program will have the opportunity to dive in the crystalline waters of the Caribbean Sea under the watchful supervision of a highly qualified dive instructor. Your day will begin in the classroom with a brief presentation on the essentials of scuba diving by an expert PADI-certified instructor. This lecture will cover all of the fundamentals of scuba, diving gear, open water diving, and underwater breathing methods. After classroom study, you'll be ready to hit the pool with your instructor. Within the safe and controlled confines of the swimming pool or the shallow water of a seaside cove, you'll become familiarized with the breathing apparatus and maneuvering with scuba equipment. Our expert diving professionals will be supervising this pool session while imparting their vast diving knowledge. Once you become comfortable in your diving equipment in the controlled environment of the pool or lagoon, it's time for some real excitement when you head out into the open water aboard one of our customized dive vessels. Under the supervision of our expert divemasters you'll then dive to depths between thirty to fifty feet to explore the amazing undersea beauty of a Bahamian coral reef where you will witness an astoundingly vibrant ecosystem full of marine creatures including tropical fish, marine turtles, and mantas. 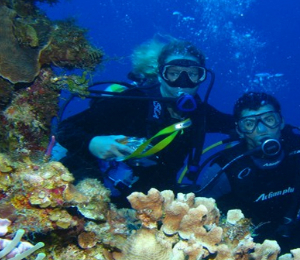 Nassau Scuba Dive is always interested in your tour experience with us. We hope you enjoyed your tour and love to hear comments. I have been to the Bahamas many times, but Dive In A Day Resort Course is one of my favorite trips! It includes everything that everyone should do here. As a Bahamas veteran, I can say only the best about this experience!